Episode 26 - We begin this episode with the tale of Krishna's adventures when he might otherwise have helped his friends in their distress. At least he got a few good fight scenes out of it, including his son Pradyumna performing heroic feats defending Dwarka, and a ground-to-air battle with a flying city! When Krishna is done with his exciting tale, the allies pack up and head for home. The tacit understanding seems to be that they will wait until the 13 years are up and only then will they come up with a plan for action. You can imagine Draupadi stewing as all this goes on. Things only get worse after the allies leave, and the Brahmins move back in. They surround their beloved ascetic king and praise him for his meekness and self-control. The Brahmins re-iterate how important it is for a king to keep lots and lots of Brahmins around at all times. This is finally too much for poor Draupadi. She finally gets fed up and starts berating her husband. The two begin debating the relative value of Dharma vs. Karma. Sitting in the woods like a Saddhu certainly did not appear to be the Dharma for a King! Kings should be men of Action. They should act now and keep acting until they have either succeeded or have died trying, because that is what Kings do! Bhima also chimes in and picks up the argument, taking up Draupadi's side. He points out that the ritual calendar is not the same as normal time, and 13 months constitutes 13 years ritually, so they are already done and can start the war right away! But Yuddistira always out-argues them all, and besides, he's the boss. 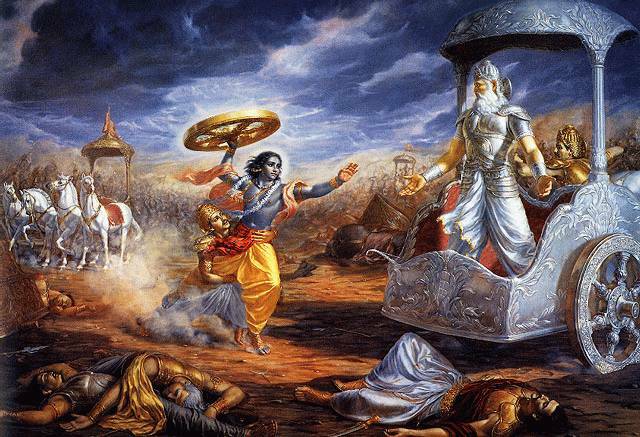 Fortunately, things are not allowed to get out of control because Vyasa shows up and gives them something to keep them busy-- find a new forest to camp in, and send Arjun north in search of Weapons of Mass Destruction! Lawrence - I did not realize these episodes were being produced now. I completed this episode yesterday and you have left me craving for more. The little production touches, like the echo effect when its the Divine's or a Rishi's voice speaking, or the way you use modern terms like 'cool weapons' keep things very engaged. If you ever visit India it would be a pleasure to meet you. Keep up the good job. This podcast definitely deserves broader hearing. I just recently started listening to your podcast and I am AMAZED at how well you have retold the epic saga! I grew up listening to these stories and now my son loves to hear them too. But not having read the whole original text and memory getting rusty with time I was looking for a good online reference. I am so glad to have found this podcast! I like how you make connections between the events, provide insights, keep it interesting with a little touch of humor, cite references where needed, stay on track (I know how difficult must that be given all the side stories and layers of intricacies involved) and make it relatable for today's audience without losing the essence. Great work indeed!